I can’t believe that we’re just 2 weeks away from having to have this room completely complete because with the state of chaos it’s in right now it doesn’t seem possible… but ya know I love a good challenge! I had no doubt that building built-ins would take up most of my time in here and I was right about that. But what I didn’t know was that I was even capable of this type of work. Funny thing about just diving into something when you aren’t even sure you can pull it off… you hit a point of no return where you have to figure it out cause there ain’t no going back. It pushes you to try new things — like using a new, kinda scary, power tool. And there are mistakes, and frustrations, and walking around multiple times looking for where you set your measuring tape, and 100 degree heat, but then one day you manage to look up at what you’ve created and see this!!! I guess in the back of my mind I knew I’d be good with creating the actual structure, but I was really worried about the finishing trim because I’d never done any wood working that required that much precision before. I even managed to do crown molding at the top! There was a bit of a learning curve — and about 4 feet of crown wasted from mistake cuts buuuuuutttt… I did it! I know I have to finish the trim there on the front of the bench seat and the baseboard on the left. I ran out of wood so I gotta make another trip to the store, but I’m already imagining pretty things on those shelves and fun pillows on that bench seat! ONE || I ordered the blue velvet fabric for the wingback chairs and took them to the upholsterer. It’s a bit of a story but I loaded one of the chairs into my car and took it to an upholstery outlet that does labor too. The guy quoted me $575 per chair. Say whaaaatttt? I don’t think so. I started thinking that maybe I should attempt to recover them myself, but there’s front stitching on these chairs which looks really good and definitely not in my skill set. So I did a little googling and found another guy (even closer to my house) that runs his own little shop out of a little warehouse spot and he’s going to do it for only $200 per chair!!! I’d say it pays to shop around! TWO || I also ordered the foam for the bench seat and the grey fabric is here an waiting for me to sew it all together so that will be happening this week. THREE || I’ve ordered a few pillows and I’m going to work with some fabric in my fabric stash too, and I’ve pinned some art and need to order a few frames to tie into the ones I already have. So yes, it will be another busy week around here, but I haven’t run out of steam yet! Thanks for being here and cheering me on! It’s been fun and exciting to be on a bit of a deadline and show you that it really is a slow and steady process. 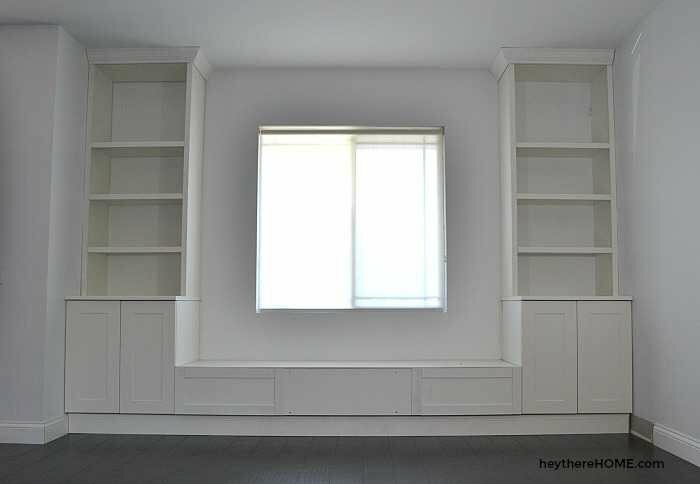 You are doing a fantastic job with your built in shelves and the crown molding. I can’t wait to see the finished room!!! They built ins look amazing. Can’t wait to see the finished room! Looks great!! I’m excited to see it when you’re finished! You give so much encouragement to others to believe they can do it, too, by posting these projects! Thanks! Wow! your work is definitely coming along and am sure, there’s no real clues that a newbie is doing the work, it looks professional! great job!